Yesterday Google announced that “interest-based” advertising is being launched in beta for AdSense and on YouTube. While some advertisers might be drooling over the opportunity to improve ad targeting based on user intent, there’s been plenty of backlash from privacy advocates. A history of blogosphere events following Google’s announcement can be found on this week’s issue of Who’s Blogging What? The post goes on to outline features that will allow users to opt out of personalized advertising. However, problems with the flawed and overly complex cookie-based technology have been described by webmaster and SEO John Andrews. 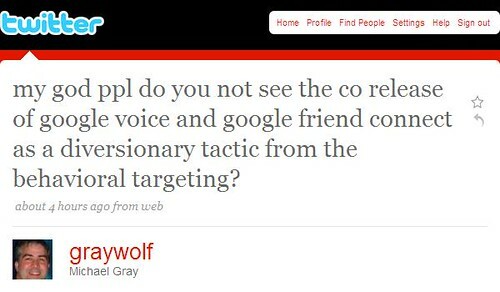 Today search marketer Michael Gray was vocal about his concerns over Google’s interest-based ads on Twitter. He theorized that announcements by Google regarding Google Voice and Google Friend Connect were intended to be well-timed distractions. In response to Aaron Wall’s post on SEOBook, veteran search marketer Bob Massa lamented the apparent apathy of the search engine optimization community. Viewing Google’s use of private data as an abuse of power and a concern for individual rights, Bob called on Internet marketers to raise the issue and create awareness. So let your voice be heard. What do you think of interest-based search?